This model from LG has pretty great picture quality, with both vivid colors and sharp contrast. Even when viewing from various angles, the picture detail on this TV is really good. Besides great picture quality, it also boasts easy-to-use features and pretty good sound clarity. The remote control features are pretty straightforward, while the menu options are really easy to navigate. Even though this is not a new model from 2017, in fact, it is 5 years old; it can still compete with some of today’s new models. There are many things you’ll like about this TV, and its benefits definitely outweigh its deficiencies. There are some black level and screen uniformity issues, but the TV excels in many other fields. Its primary strength is the color performance, which is pretty smooth and even. Also, it has a pretty wide viewing angle as well as great screen size (55 inches) meaning the LG 55LE5400 is a great choice for wider rooms. Being a 55-incher, the front of the TV is mostly screen. You might find it a bit annoying that the frame around the screen is pretty reflective so you’ll probably see ambient light gleaming from the frame. Along the bottom of the screen is a series of indicator lights and onboard controls. All the ports on this TV are located on the back. Some face the side, and some face out of the TV. This model is really thin meaning there is no room for controls or ports on the side. The stand feels quite sturdy and is pretty heavy. The same shiny plastic that covers the bezel covers the stand as well, but there is a metal core. There is a metal yolk when you attach it to the panel. That shinier, darker plastic on the back of the LG 55LE5400 is just covering hiding the metal. Despite its size, this TV panel can swivel on the base. The controls along the TV’s bottom are not push-able, hard buttons, but nice, touch-sensitive areas. However, the slightest touch will leave fingerprints on the shiny plastic, so you’ll probably wish to stick with the remote. Speaking of remote control that comes with this TV, it is fairly good. It is light and thin, with comfortable buttons. Overall, considering the TV is 5 years old, people can still appreciate its thin frame and giant screen. 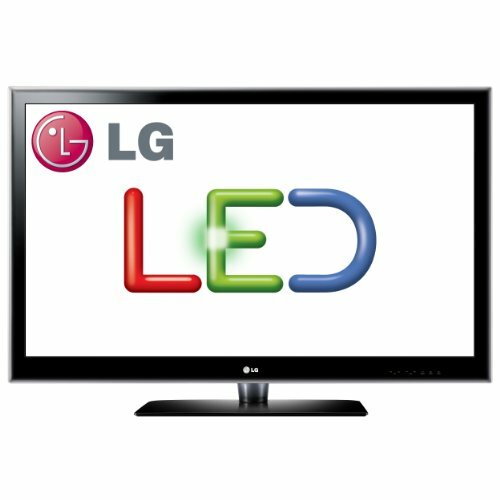 LG’s LED technology delivers amazing color detail, contrast and brightness, brightness, and ensures a slim profile. Also, this type of TV is more energy saving than conventional LCD TVs. 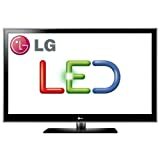 The LG 55LE5400 boasts Full HD 1080p resolution, so it provides superior picture quality over standard HDTVs. You will be able to see more vibrant colors as well as more details. This TV also has AV mode meaning you are able to customize settings for watching movies, sports, and video games. This feature allows you to easily choose from one of three available picture modes for “Sports”, “Cinema”, or “Games” in order to enjoy an optimized sound and picture experience. This model from LG is Wireless 1080p ready, and this connectivity allows you cut loose from lots of messy cables and wires. You are able to hang your TV anywhere you want while still getting a stunning Full HD picture. All those annoying cables and cords are completely out of your sight. There are many more great features with this TV, and it is still a really good TV, even 5 years after its release.